A simple, short-cut, baked snickerdoodle donut doused in cinnamon glaze, and topped with Cinnamon Pebbles! 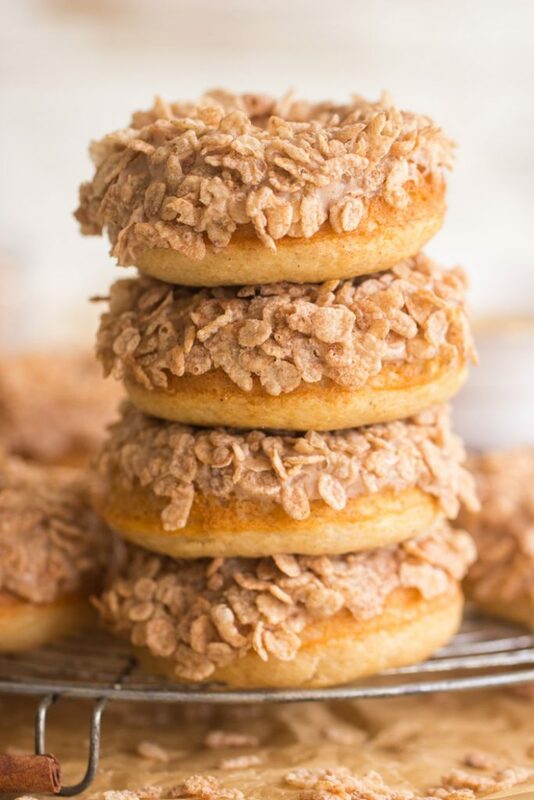 These Baked Cinnamon Sugar Donuts with Cinnamon Glaze start with a cake mix and require only a handful of ingredients, but they’re a cinnamon explosion! 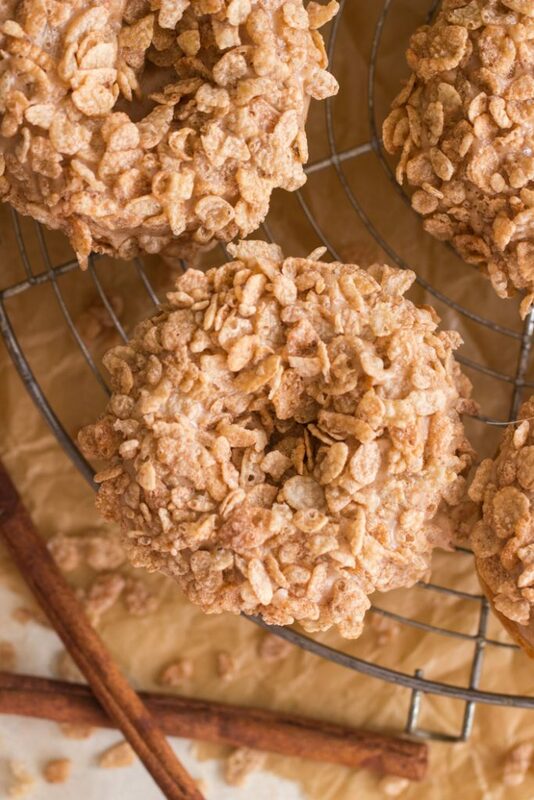 You’ll love the cereal on top for crunch and extra sugar & spice. Yay – the weekend is here! At long last. This was a super busy week at work, and I traveled for much of it, so I’m beyond elated that it’s Saturday morning, and that it’s going to be a lazy, chill morning, at that. My S.O. usually wakes up early on Saturdays and wants to go to the gym at like 8am. That is NOT my style. My body stays wound up all week for work, gym, the blog, etc, and my body knows when it’s Saturday. It’s the only day of the week that I stand a chance to sleep in. On Friday night, I start to feel the weight of the week lifting, and all the relaaaaax vibes set in. Are you like this?? More than anything, I love a Saturday in the fall. My favorite season, and the most relaxing day of the week = bliss. Our weather’s also been really nice lately. Lots of sunshine, beautiful clouds, and the humidity has finally evaporated. There’s some tropical activity to keep an eye on, but so far it’s just brought strong breezes and lots of wind, which has actually been lovely. 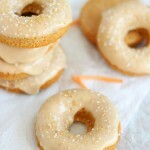 For this particular Saturday, after a grueling week, I wanted to make one of my favorite foods in the world: donuts! 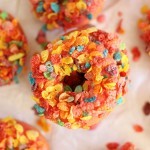 I made these Baked Cherry Donuts with Cherry Glaze and Fruity Pebbles Topping a few years ago, and I adore that recipe. 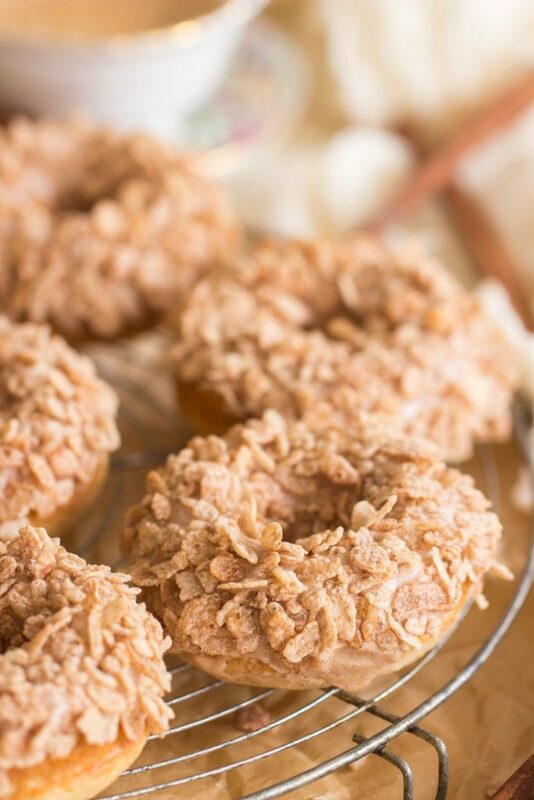 I love that the donuts are baked, I love that they’re easy, and I love the sweet, crunchy, Fruity Pebbles cereal on top – it brings all the flavors together, while also adding whimsy! I wanted to play off the Baked Cherry Donuts recipe, so I came up with the idea for these Baked Cinnamon Sugar Donuts with Cinnamon Glaze, and I topped them with Cinnamon Pebbles. 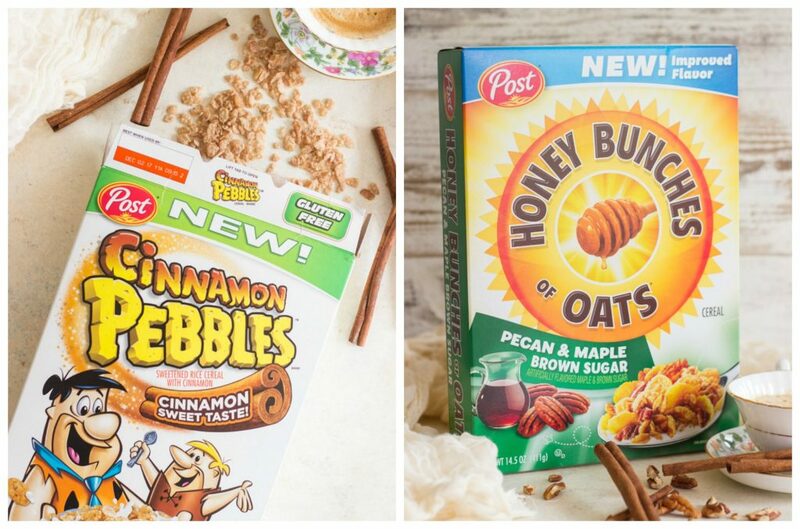 Yes, Cinnamon Pebbles! Did you know about these? I heard they were happening, and I couldn’t wait to get my hands on them! 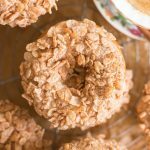 I picked up boxes of Cinnamon Pebbles, Fruity Pebbles, and Honey Bunches of Oats at Publix last night so I’d have cereal on hand for breakfast – and for topping these donuts! 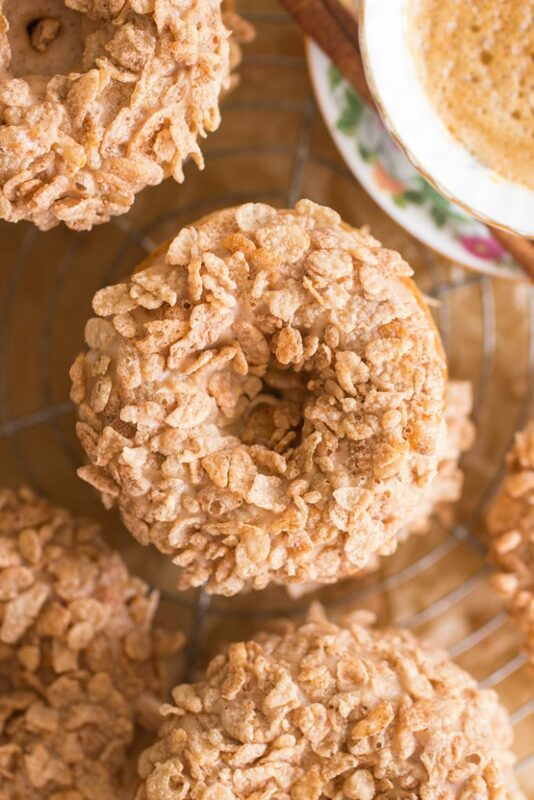 How perfect are Cinnamon Pebbles with these Baked Cinnamon Sugar Donuts?? My Saturday morning is as relaxing as I hoped, even making a batch of these. You can have them ready in about 30 minutes, start-to-finish, and they don’t require many ingredients or much work. 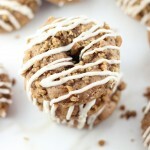 These Baked Cinnamon Sugar Donuts actually start with a cake mix too, so they’re ultra simple! I vowed to make more donut recipes in 2017, and I have failed so far. 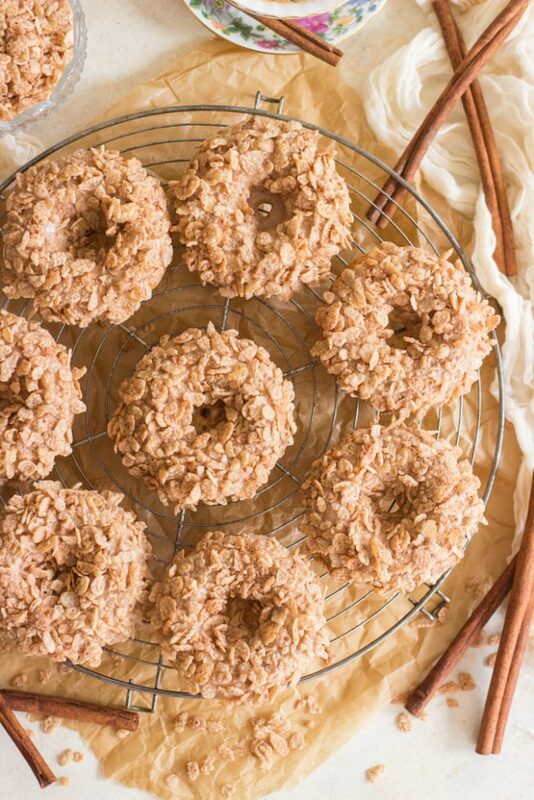 When I was dreaming up fall recipes recently, I knew that I had to make at least one donut recipe. 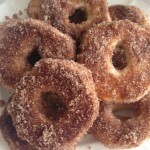 Here it is, these Baked Cinnamon Sugar Donuts with Cinnamon Glaze, with hopefully more to come! These are an *amazing* start. A simple, short-cut, baked snickerdoodle donut doused in cinnamon glaze, and topped with Cinnamon Pebbles! These Baked Cinnamon Sugar Donuts with Cinnamon Glaze start with a cake mix and require only a handful of ingredients, but they're a cinnamon explosion! You'll love the cereal on top for crunch and extra sugar & spice. In a large bowl, combine cake mix, water, egg, oil, butter, and cinnamon, stirring until just smooth. Allow to cool in pans for 10 minutes, then carefully remove donuts to a wire rack to cool completely. Do not cool donuts completely in the pan or they will stick! 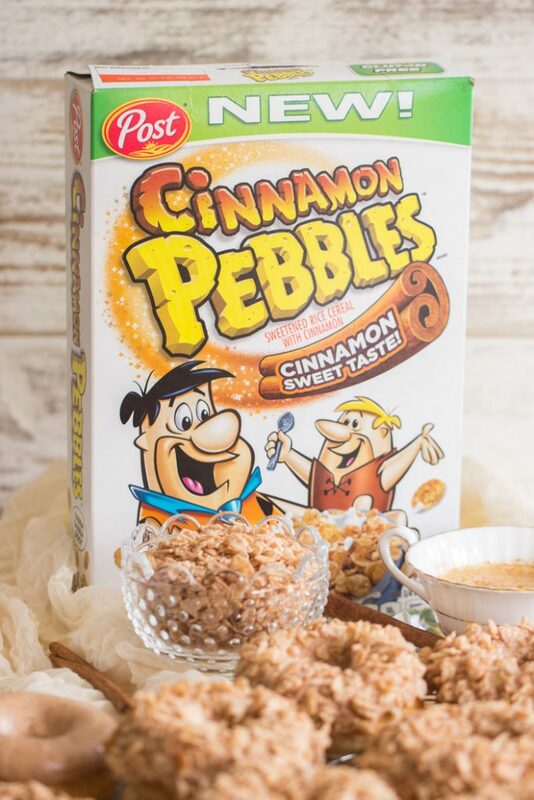 Place Cinnamon Pebbles cereal in a small bowl. In a medium bowl, whisk together powdered sugar, cinnamon, butter, and coffee. The glaze should be thick enough that it won't run off the donut, but thin enough that you can dunk the donut, and it won't be difficult to pull the donut back out of the glaze. If you need to adjust the consistency, you can use a little extra coffee to thin it out. Also, as the butter cools, the glaze thickens, so as you dunk donuts, you may need to heat the glaze for about 5-8 seconds (that's it!) to re-thin the glaze a little. Dunk each donut into the glaze, and then immediately into the Cinnamon Pebbles. Place back on wire racks to set. Eat!! 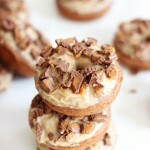 I have a few other simple donut recipes too, so if you’re looking for other ideas, check out this Baked Red Velvet Donuts recipe, these Spice Cake Donuts with Pecan Streusel and Brown Butter Icing, these Baked Pumpkin Donuts with Maple Cream Cheese Glaze, or these Baked Chocolate Donuts with Peanut Butter Glaze!